Non-GMO pea protein, xylitol, oat bran, natural mixed berry flavor with other natural flavors (milk), natural vegetable juice color (beet, carrot and yam), xanthan gum, guar gum, FOS blend (fructooligosaccharides, fructose, sprouted mung bean extract, maltodextrin, stevia leaf extract, glutamic acid HCl. Add 1 rounded scoop to at least 8 oz of cold water, juice or your favorite beverage. Shake or stir briskly until smooth. Best if served cold. weve taken the Solaray brands most popular Multi-Vita-Min mineral supplement and transformed it into a protein-packed smoothie with high-potency vitamins, powerful antioxidants and important bone-building nutrients. Like the other Spectro products, Spectro Smoothie powder offers a full spectrum of more than 50 vitamins, minerals, antioxidants, electrolytes, herbs, digestive enzymes, bee products and whole food concentrates. 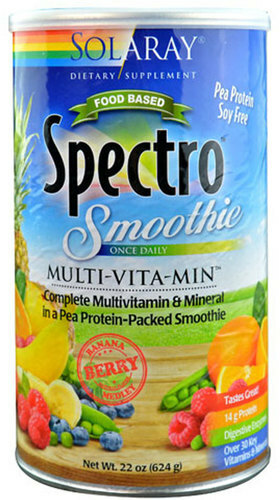 Each serving of Spectro Smoothie drink mix also provides 14 grams of Non-GMO soy protein.